"Within ourselves or nowhere must lie the reason for everything"
Eurythmy to the first "Hymn to the Night"
"The imagination places the world of the future either far above us, or far below, or in a relation of metempsychosis to ourselves. We dream of traveling through the universe - but is not the universe within ourselves? The depths of our spirit are unknown to us - the mysterious way leads inwards. Eternity with its worlds - the past and future - is in ourselves or nowhere. The external world is the world of shadows - it throws its shadow into the realm of light. At present this realm certainly seems to us so dark inside, lonely, shapeless. But how entirely different it will seem to us - when this gloom is past, and the body of shadows has moved away. We will experience greater enjoyment than ever, for our spirit has been deprived." Friedrich Leopold, Freiherr von Hardenberg, took his pseudonym Novalis from "de Novali", a name formerly used by his family. Of noble and well-connected stock (a Freiherr was equivalent to a baron), Friedrich Leopold studied philosophy, law and later geology, and served as a government official. 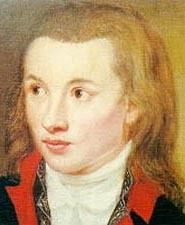 But as Novalis he was the author of poetry and prose whose themes were spiritual, philosophical and romantic. 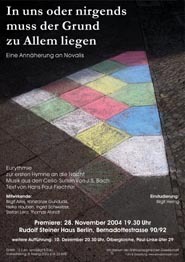 He wrote "Hymnen an die Nacht" ("Hymns to the Night"), his only complete collection of poetry, following the death of his first love Sophie von Kühn in 1797.